Who doesn’t love an elephant or two… or three or four… and purple ones at that! 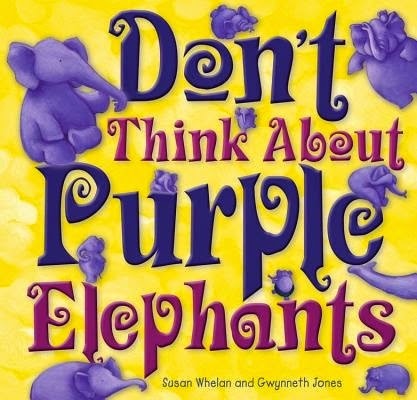 Don’t Think About Purple Elephants is a charming children’s picture book with a cast of colourful cavorting characters, topped off with a gentle and subtle message for anxious children. Meet Sophie. Sophie is a 'night-time worrier'. She doesn’t worry during the day, when she is at school or busy having fun with family and friends. But at bedtime, when everything is quiet and still; when there are no games to play or lessons to learn, Sophie starts to worry. Like some children (and even some adults), Sophie allows her worries to stop her from sleeping. Her family tries to help, but Sophie worries even more. Till one day, Sophie’s mother suggests a new strategy… that involves an elephant or two! Children will not only identify with Sophie’s fears, but parents will appreciate this simple method which can help children deal with their worries. Based on a simple psychology approach, Don’t Think About Purple Elephants will spark a child’s imagination as well as cultivate a fun bedtime routine. An excellent parent and teacher resource for social and emotional learning, this enjoyable picture book is a must-read for every young worrier. Beautifully crafted by our own Susan Whelan, Don’t Think About Purple Elephants is an absolute joy to read. Gwynneth Jones’ illustrations are simply adorable. Each emotion is skilfully described and cleverly illustrated, with the use of colour and black and white images, making it easy for children to understand. Young children will also love spotting the playful elephants and talking about the various antics they get up to. Packed with colour and creativity, this little girl’s story of finding a way to ease her worry is bound to become a family favourite to read again and again. And I’m sure, like me, you won’t be able to stop thinking about these delightful purple elephants, or perhaps even cheeky blue monkeys, for a very long time.